Whale songs traveled from the ocean to the pop charts in 1970, when folk singer Judy Collins recorded an old whaling song, "Farewell to Tarwathie," accompanied by haunting humpback vocalizations. 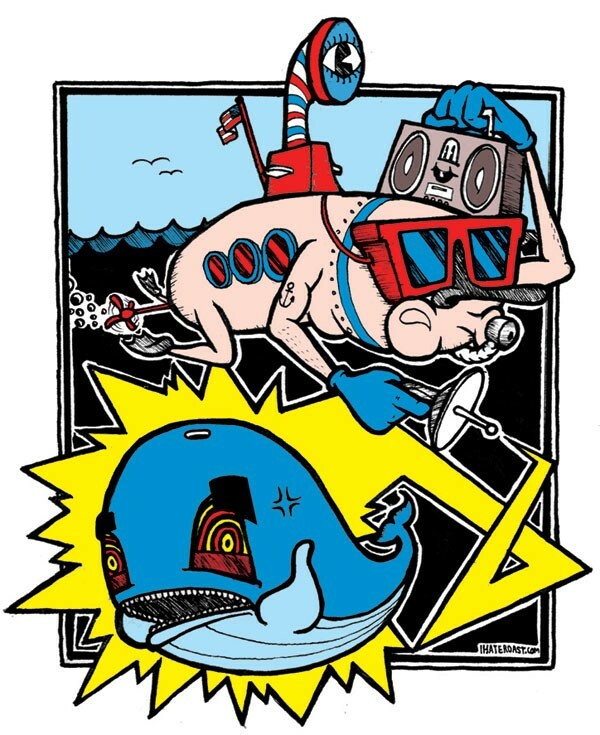 The song, over 150 years old, mourns that no bird "can sing to the whale." Alas, 'tis still true. Although technology has invaded the seas with countless sounds, it is far from a serenade down there. Humans' ocean noise, like an audio harpoon, can cause panic and dysfunction in marine mammals, occasionally to the point of death. Concerned citizens want that sound turned down, and in an ongoing fight to keep sea mammals alive, they're even willing to take on the Navy. The U.S. Navy is increasing its Pacific training activities in waters from Mendocino to well beyond Puget Sound. To operate in this area, known as the Northwest Training Range Complex, the Navy is required to obtain training permits every five years, and the most recently issued permit has triggered public outrage over what some consider insufficient protection of marine mammals. In January, a lawsuit was filed by Earthjustice, representing a coalition of native tribes and environmental groups, against the National Marine Fisheries Service under the Marine Mammal Protection Act. The lawsuit calls for the NMFS to "mitigate anticipated harm to marine mammals and biologically critical areas within the training range that stretches from Northern California to the Canadian border." Trainings allow the Navy to test weapons, use sonar, sink vessels, track aircraft and release toxins. Though it is possible for whales and other mammals to escape a physical threat, they have a harder time escaping noise, including sonar. Active sonar can affect marine mammals, and the Navy is required to mitigate these impacts. The question is whether the Navy is doing its utmost to protect wildlife while still carrying out its core mission. "I think people don't realize that when the Navy says, 'We're going to preserve and protect [sea life],' they aren't going to," says Rosalind Peterson, a Mendocino activist opposing the Navy's Northwest Training Range permit. "If they had to do effective protections," Peterson adds, "they would not be able to do the type of testing they want to do." Peterson claims the Navy is expanding its testing territory, taking more marine life and dumping more toxins in the ocean. Mark Natsunaga, representing the U.S. Navy Hawaii-Pacific Fleet, denies these claims. 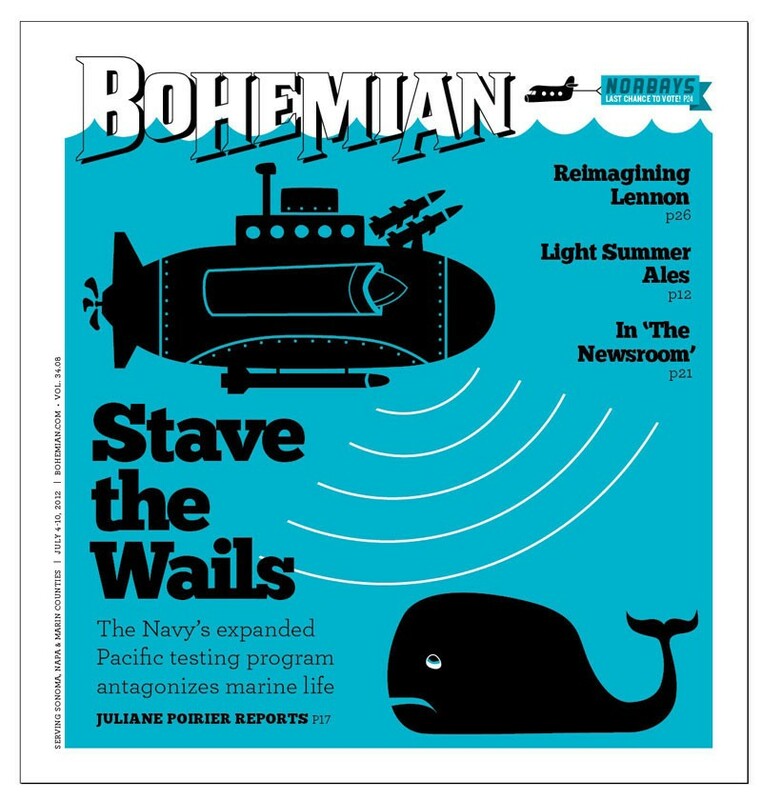 "Geographically, we are not adding area but increasing activities," Natsunaga tells the Bohemian. "Submarine warfare is different now than what people saw in Red October, because submarine technology has changed. Diesel electric submarines can be very quiet if running submerged on battery power, and are quieter than a fan on your home computer." Submarine warfare was once carried out at short range, when submarines were noisier and had to get closer to the ship to sink it. Now the lethal range is longer and the subs are much harder to detect, so detection skills of naval personnel must advance—using midfrequency active sonar. Public concerns about sonar harming marine mammals dates back over a decade, when the Scripps Institution of Oceanography, part of UC San Diego, used sonar in long-term research to measure core ocean temperatures (the speed of underwater sound travel alters with temperature). A Scripps report from 1995 states that the low frequency sound emitted by some marine mammals—which enables them to navigate, communicate and feed—could be upset by human-issued sonar. The effects on these marine mammals, according to the report, "may range from no impact to subtle changes in behavior, temporal behavior disturbance of avoidance or important feeding or calving areas, deafness, and possible death." The Navy's Northwest permit claims no animal deaths are expected from sonar, but marine scientist Fred Felleman disagrees. 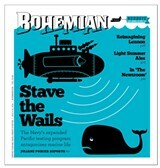 Felleman, Northwest consultant to plaintiff organization Friends of the Earth, says midrange sonar can deafen a whale. "A deaf whale is a dead whale," says Felleman. "And noise is not even included in the [NOAA and NMFS] definition of critical habitat for marine mammals." A 2003 video by the Center for Whale Research in Washington's San Juan Islands shows a pod of whales during a sonar blast from a Navy vessel. A siren sound is heard as 20 killer whales appear as if in panic, speeding erratically back and forth toward the water's edge, away from the sound. That sound can have a negative impact on mammals is universally known, says Felleman, but how to mitigate it is not. "Sound can cause anything from a mild disturbance to distress," explains Felleman. "And midfrequency sonar can cause tissue damage." Sounds can also create such a severe panic in marine mammals, according to Felleman, that they could surface too fast and get the bends. "Marine mammals have been around 30 million years or so and are uniquely evolved to live in the ocean," says Felleman. "The Navy was not required to get permits until recently when they were sued by the [Natural Resources Defense Council]. They intentionally expose animals to sound rather than using hydrophones to listen and track animals noninvasively."